Interstellar starring Matthew McConaughey, Anne Hathaway, and Jessica Chastain. If any movie demands to be seen on an IMAX screen, it’s Interstellar, Christopher Nolan’s latest epic about space travel. Similar to Inception, Interstellar is like nothing you’ve ever seen before and reaches far beyond what even your own imagination is capable of. It’s a movie that tests the limits of physics and our basic understanding of the concepts of time and space. A central theme in the movie is something completely different for Nolan and something that even science struggles to explain – love. Despite the fact that love is a major theme in the movie, it doesn’t get overly and unnecessarily sentimental, but it does have a number of genuinely touching moments. The other major theme is survival – what society and what individuals are willing to do in order to survive. Nolan shows us a world that can no longer support its inhabitants; it is depressing, dusty, and the advancement of technology is just an afterthought. In fact, Earth’s most important job is now farming, and that’s where Cooper (Matthew McConaughey) comes in. He is a former NASA pilot who loves to build things and longs for the days when mankind lived to explore new worlds. Now that those days are gone, he feels completely out of place, much like his daughter Murphy. Together with his Father-in-Law and two kids, Cooper owns a corn farm that, eventually, is going to fail just like all the others in his area. After a decent build-up, the main plot of the movie gets underway. One of the main taglines for the film was, “Mankind was born on Earth. It was never meant to die here”, and that’s why Cooper and a small team (consisting of Dr. 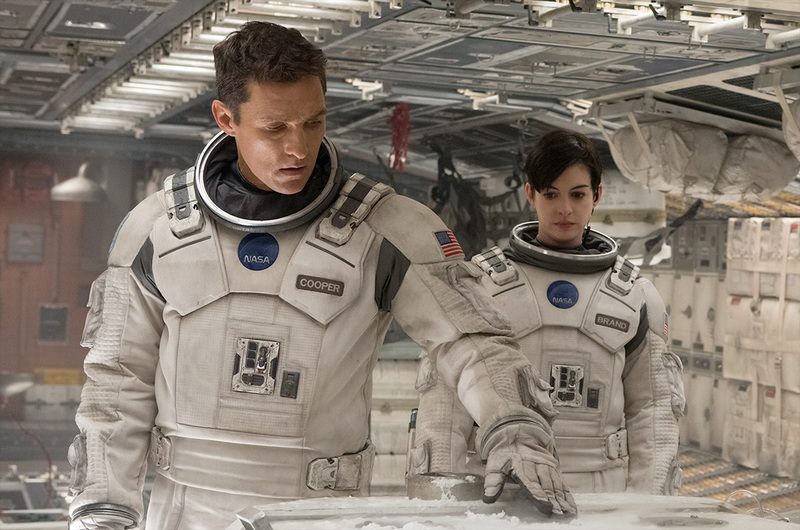 Brand – Anne Hathaway and a couple others) decide to leave Earth in search of a new home. To say any more would be a mistake. Interstellar is so complex and has so many good supporting characters (most of whom will be recognized immediately) that explaining the plot away would ruin it for the viewer. Interstellar is by far the most ambitious movie of 2014 and has been picked apart by critics for reasons that don’t really matter. It is a science fiction movie that deals with phenomenon that the average person (and even the highly intelligent person – though they will likely not admit it) does not fully understand. Black holes, worm holes, relativity – these are things we know exist, but even Ph.D’s in astrophysicists can’t fully explain what they are and how they behave because no one has experienced anything like it. So how can it be expected that a Hollywood film, even if it is directed and written by a genius, would get it 100% correct? If you go into the film looking for flaws, it is almost a guarantee that you will find them. So here’s a suggestion – turn off the brain, open your mind, and let your emotions dictate whether you enjoy the film or not. You will leave the theatre with burning questions and will want to discuss it with friends, but you will also leave satisfied, and maybe a little sore and tense. The near-constant action, combined with the Hans Zimmer score, is like nothing else; even Gravity can’t match it. Watching it in IMAX, the sound (and even the complete silence) is deafening and the visuals are spectacular. In true Christopher Nolan fashion, the best part is that you don’t know where it’s going or how it’s going to end. It takes nearly 3 hours to get to that ending but it doesn’t drag for even a moment. Matthew McConaughey was great, as we’ve come to expect lately, and Anne Hathaway was surprisingly “not irritating” as Dr. Brand. The movie’s humour happens to come from two robots that provide the necessary comic relief from time to time. Michael Caine and Jessica Chastain are equally as good and perfectly cast. Once again, Hans Zimmer’s score makes every scene an epic one and the use of perfectly timed silence leaves you wide-eyed and breathless. Of course there is always the possibility that people will think that it is too much, too unbelievable, and too long, but overall it is a movie that should not be missed. Give it a chance, it’s worth it.